Wenzhou, China, 2019-Jan-30 — /EPR FOOD & BEVERAGE NEWS/ — Nitrogen is well-known to be an important element in the proper storage of coffee. Since AFPAK, one of the leading K Cup filling machine manufacturers, always makes sure that they are ahead in the industry, they have applied the nitrogen flushing system to their K Cup Filling Sealing Machines and their other coffee capsule packaging machines. This means that clients no longer have to worry about nitrogen issues as each machine will have 5-6 nitrogen flushing stations to keep more than 90% of nitrogen inside the coffee capsules and filled and sealed K cups. “We always think of ways on how we can improve our machines so we can cater to our clients better. The nitrogen flushing system is another feature we offer our customers so they can be guaranteed that their coffee capsules are stored properly. We try to stand out among our competitors by realizing what our clients need even before asking them. This additional feature shows how we carefully think about what a coffee capsule packaging machine should be.” AFPAK Sales Manager, Monica, shares about their machines. The company has developed a K Cup Filling Sealing Machine that is capable of flushing more than 95% of nitrogen inside the K Cups. The machine was designed automatically, which only requires one person to operate the machine properly. This promotes faster production that saves time and labor costs for the clients. AFPAK is so pleased with this development as it makes the production process efficient. Aside from the nitrogen flushing system, the K Cup Filling Sealing Machine is easy to use and maintain. It is also servo motor-driven, which ensures high accuracy and stability. AF-HK1 K Cup Coffee Capsule Filling Sealing Machine: This is the most basic machine that only operates one lane and can produce 30 K cups per minute. It comes with carrier plates that are pneumatically driven, a small footprint layout, and can handle various styles of capsules with easy size changeover. AF-HK2 K Cup Coffee Capsule Filling Sealing Machine: This machine operates two lanes and can produce 100 K cups each minute. It is servo-driven and can easily be operated and maintained. One machine can use both separated and welded K Cups. It guarantees stability and high accuracy manufacturing process. 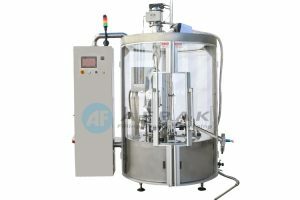 AF-HK4 K Cup Coffee Capsule Filling Sealing Machine: This is a four-lane machine that can produce 200 K cups per minute. Other features can be added depending on the client’s needs and the recommendations made by AFPAK engineers. AF-RK1S K Cup Coffee Capsule Filling Sealing Machine: This machine only has 1 lane working and can produce 50 K cups per minute. However, it comes with fast speed, which makes the production process time-saving and cost-effective.